Picked up my new Garmin 76CSx.....which maps? Thread: Picked up my new Garmin 76CSx.....which maps? Looking to download map data into the SD card. 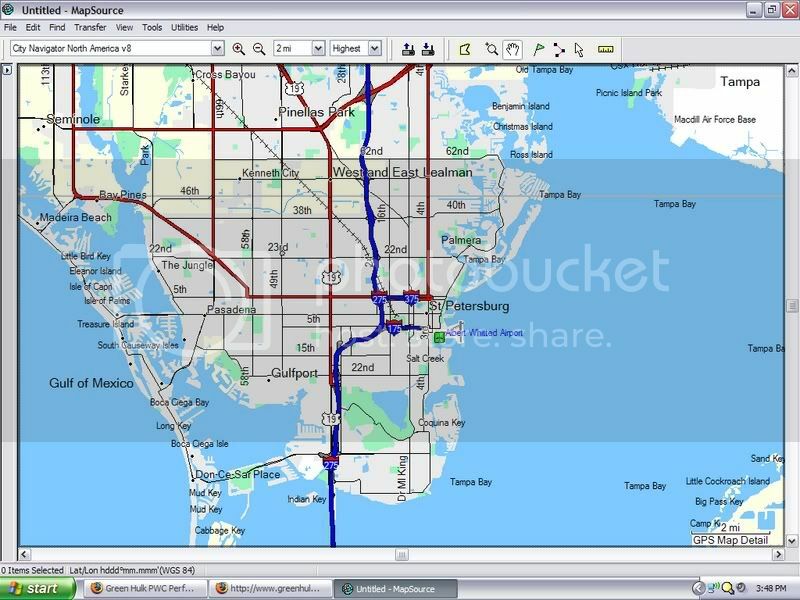 What's the best place online to get maps? 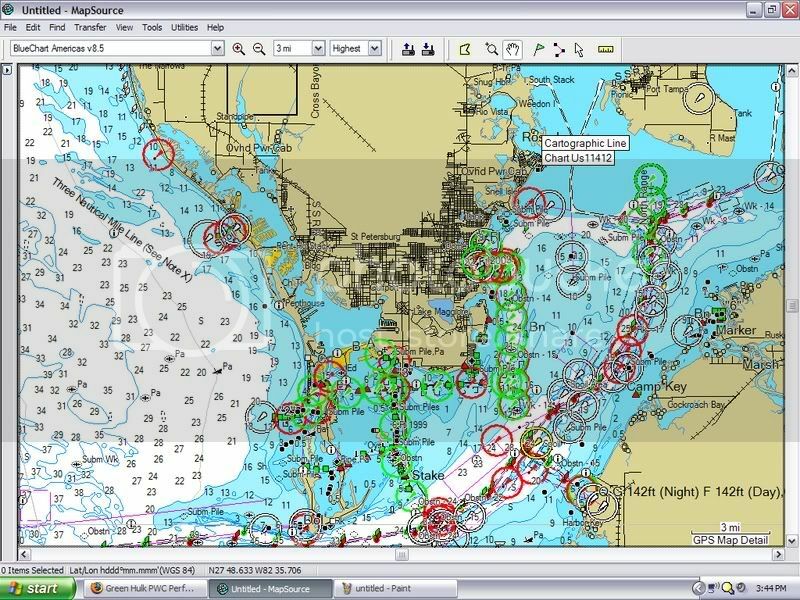 Went to Garmin.com and they have nautical information, but I would like to get detailed local information (in and around Tampa/St. 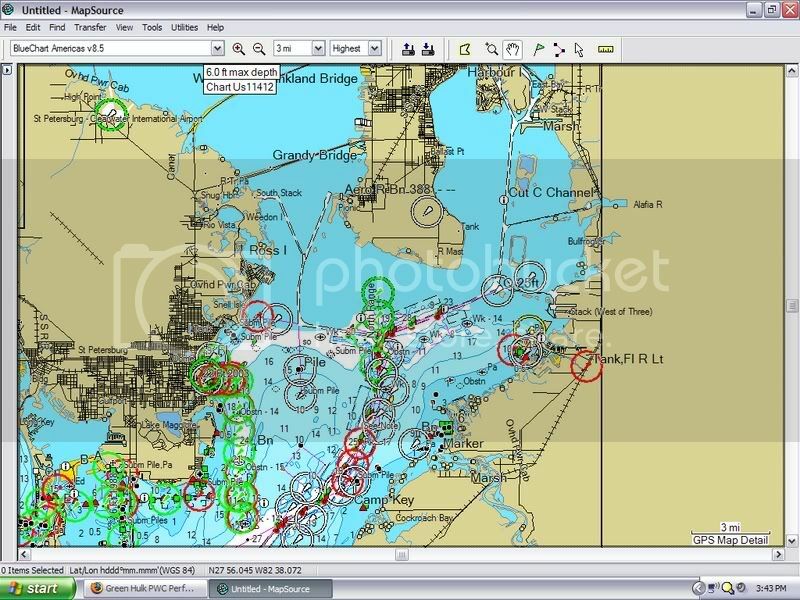 Pete) for both nautical charts and roads/city information. got my garmin City Navigator and America's Bluechart from Amazon.com....saved some $, but the prices weren't too different, no matter where I looked. oh....and another thing. I got a gig microSD online (don't remember if it was Cir. City, Best Buy, or what). But, I do remember saving like $20 buying it online and picking it up locally at a store. I've got Bluechart & City Navigator for my 76CSx. Small little downside to this hand held unit (and I believe all Garmin handhelds)... you can only use one map at a time, so read up on that, you might want to get one card to hold your City Navigator and one to hold your Bluechart. I just use the Bluechart, since I just keep it on the boat. The stock 128k card is enough to hold the detail of the entire southeastern U.S. Luckily, the street database on the Bluechart is fairly detailed, but the only way to get step-by-step directions is with the City Navigator, and even then you have to program that information in before hand on your PC with the Waypoints Manager. That fact, along with the little screen and no voice directions is the reason I never try to use it in my car (besides, if I used it in my car too, my "max mph" screen would never be the max mph I've achieved on the boat, which is one thing I want to track). The 76CSx is highly configurable though, so think about that as you're reading the instructions. I have mine startup on the map page (not the default "aquiring satellites" BS), with a box for my current speed, and another for my max speed. I work in Brandon, if you really need help. Goodluck with your new GPS!!! Not to Hijack your thread but just wanted to find out if anybody has this GPS? My wife new that Ive been wanting a handheld GPS for my jet-boat so she found an awesome deal on walmart.com for $87.00 it's the GARMIN etrex basic model. Ive been reading up on it and it seems like a great little unit. I'm realy only gonna use it for the speed counter,odometer and distance counter and stuff like that so I hope I like it. Anybody have this model? If so how is it? Thanks for any info.. So if I get the bluechart "americas" CD I can simply download the map sheets that I'm going to be interested in onto the SD card that came with the unit? It looks as though there's a lot of data in there that I won't be needing to use (west coast, ak, etc)....so a smaller SD card shouldn't be that big of a deal I'd think. Should I buy the SD card with the map data or get the CD and use the sd card that came with the unit? I probably won't get the city navigator data, since I doubt I'll use that. I went with the color CSX because I'm into scuba diving and such. Obviously, if you're not a mariner or you don't have a boat that draws 15 meters, then full color navi/nautical charts aren't really necessary. Like most electronics, the biggest/baddest version probably has way more stuff than you actually need/utilize. I just like the idea of not having to tote around full size plastic NOAA charts. I've had Magellan GPS in the past and was pretty pleased with those, but I used them for different purposes (land navigation). I would think there's probably a better "all in one" unit out there....one that can do marine navigation AND do city directions (like a Tom-Tom, etc), but to find one that floats and one that has the convenient little console wasn't an option. i've got both maps on one card...simple to use. just turn one off and the other on, if you change uses. You're able to "hide" different maps. Actually, sorry, I just looked it up and saw that I don't have the Bluecharts, I have "US Recreational Lakes" [just called US Inland Lakes now]. Since that is more focused on interior waterways, maybe that's why it also has a good street database with it. I don't have any experience with the Bluecharts, but it's supposed to have a "sick" (as the kids would say) amount coastal data, if that's where you boat the most (but I bet the street data is low). I'm 95% freashwater lakes, myself, so the Recreational Lakes worked good for me. The problem with Bluecharts is, it's VERY expensive, and they only sell you a small little area per package. If I needed Bluecharts, I would have gotten one of the larger GPSs, like the GPSMAP 478, that come preloaded with Bluecharts and City Navigator, and would be a whole lot easier to see. It's very hard to see a lot of detail on a little handheld unit. With just 128k, the stock card will be a little tight to fit a lot of multiple chart data on it. Personally, I like to have the original CD/DVD. The data on those cards can get erased, or lost, etc. get the CD then load it onto card(s) as you see fit. edit: couple samples...get more detailed as you zoom in. city navigator and two bluecharts. Last edited by SeanCucf; 07-24-2007 at 03:17 PM.